Gripping. Engaging. Rich characterization. Sensory detail. These aren’t words commonly associated with reading non-fiction. Every one of them is an accurate description of Isabel Wilkerson’s chronicle of “the biggest underreported story of the twentieth century”. 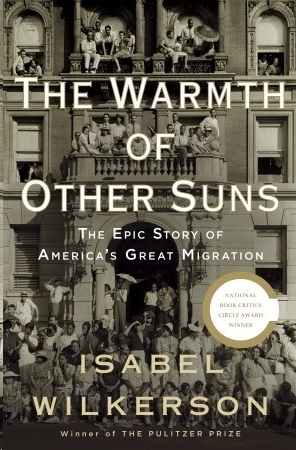 It’s “The Epic Story of America’s Great Migration”, as the subtitle states, and Isabel Wilkerson tells the story through the experiences of three individuals. Ida Mae Brandon Gladney. George Swanson Starling. Robert Joseph Pershing Foster. In the beginning, these names are just words on a page. And a lot of words, too: immediately the reader wonders how these long-named people will take on a presence in the sprawling narrative. Isobel Wilkerson won a Pulitzer for her journalism, so readers expect that she won’t have any trouble getting the facts straight. But there is something truly remarkable that sets this work of history apart from the other works sitting alongside it on the shelf, something beyond the verifiable details. And that “is the larger emotional truths, the patient retelling of people’s interior lives and motivations, that are the singular gift of the accounts in this book”. The book’s opening pages consist of very brief glimpses into Ida Mae’s and George’s and Pershing’s experience, which are followed by a broader sweep of the historical matters that the book considers, and this alternating pattern repeats, with the emphasis on personal experience and memory. But what sets Isabel Wilkerson’s work apart? What makes The Warmth of Suns such a powerful work? How does she pull the reader into her scholarly research so effortlessly? In the first 75 pages, the reader can choose to take this journey with a 15-year-old girl who’s being courted by two handsome and determined young men in Mississippi, with a 20-year-old young man who is trying to trick his father into being allowed to continue his education, or with the ambitious son of two schooteachers. Very specific experiences drawn from their memories (readers also have glimpses of these three in the late 1990s) pull the reader into individual lives and memories. Turkeys and uprisings, schoolbooks and lynchings, sunrises and statutes; the details flesh out the experience in a way that memorizing dates and events cannot. Even the use of language alters as the book progresses; individuals called “colored” in the early chapters are, later, called ‘black’. The details matter, and the personal is political. At once, the migration is an event of historical significance, which resides in the pages of history books, and it is just what happened in people’s lives, something residing in photographs and letters and memories of countless families. Throughout The Warmth of Other Suns, readers come to feel as though they know the individuals whose experience is placed at the heart of this work. It is as vivid and striking an experience as reading a novel, and Isabel Wilkerson employs techniques more commonly associated with writing fiction. She is particularly adept at sketching scenes and choosing emotive moments to represent an individual’s changing internal landscape. Scenes from throughout their lives are described with rich sensory detail, so that one not only understands what happens, but can almost feel it. Sometimes these are moments which revolve around something to celebrate and, of course, these are moving and inspiring. But what adds demonstrably to the power of her work is her inclusion of moments in which her key subjects felt shamed and moved to despair. These are ordinary people; they took risks that didn’t always “pay off”, made decisions that they later realized were flawed, flat-out made mistakes, and, sometimes, they triumphed. Her decision to represent these people as multi-faceted individuals adds power to the work as a whole; it truly brings the history off the page. Although the focus remains steadily on her key subjects — and this is handled deftly, with the reader returned regularly to these touchpoints like a motif in a symphony — just a few sentences can remind the reader of the expanse of the work. It happens like this. There is a scene. There is a statement. There is another statement. There is room to contemplate. There is a small moment of confusion and anger when a mother burns a child’s shoes because a local healer has advised that the boy’s convulsions will stop if what he’s wearing is burned while he is seizing, and the father learns of this and must reconcile this decision with the fact that he has had to go without shoes himself while working sun-up to sun-down. There is a brief commentary about the state of the world in the wake of the 1929 stock market crash; it is observed that the sharecroppers’ families cannot afford shoes, and it is observed that the planters’ families are not riding in the latest Model T’s. There are sharecroppers, there are planters, there are merchants, there are banks, there are northern investment companies: Wilkerson never strays from the fact that she is sketching the experiences of individuals, but they are individual people inhabiting a web woven across an expansive and complex landscape. This is a work that defies encapsulation, the body of the text over 500 pages and the supporting materials another 75 pages. It’s tempting to extract longer portions, to try to mimic the breadth of experience represented, either by sharing more details of individuals’ experience or by quoting passages of commentary, but ultimately this work must be experienced as a whole as much as for its parts. If history can be realer than real? That’s what The Warmth of Other Suns accomplishes. I saw the author interviewed on Charlie Rose last year, she made me want to read it, such an interesting premise- seeing the migration of southern blacks as a wave of ‘immigration’, so to speak. I looked it up in the library, found the ‘size’ daunting:-) But, you know after reading your review, I think I’ll give it a go, thanks. I saw Isabel Wilkerson at the National Book Festival last year and she was an engaging speaker. I plan to read this book this year. I like what you say about the sweeping and specific. I love it when nonfiction books strike the right balance between the details and the big picture. The details help me really visualize what it was like and the big picture helps me see the significance and larger implications. That’s the way that it is for me too, Christy; I suppose every reader will crave a slightly difference balance, but Wilkerson’s works perfectly for me. It’s good to know that she’s an engaging speaker, too, which isn’t entirely surprising either, as she’s clearly passionate about her subject; I would’ve liked to have had that opportunity to see her! Thanks, Melwyk. I wouldn’t’ve added that book to my list in a million years, so thanks for bringing it to my attention; I’ll let you know when I’ve given it a read! I have been reading all of you BHM posts and feeling completely inadequate about what to comment, because all of these books are “new” to me. Not so much the titles and the themes, but I haven’t read a single one of them! This is another that goes straight on the wishlist. I love history books (being a history major myself), but you very rarely see someone writing about it so passionately, so I’m extra curious. Isn’t it funny when that happens? Sometimes, when my Reader’s backed up for a couple of weeks, I’ll be looking at a dozen posts on someone’s site in which not ONE of the books is familiar to me, or the authors even, and then I sit and wonder what I’ve been so busy reading while those blog posts were accumulating, cuz obviously it wasn’t any of those books?! So many books! But, yes, Wilkerson’s passion definitely sets this work apart; I think you’ll enjoy it a great deal. I’ve heard so many good things about this book including from a coworker. I just might have to put myself on the hold list for it at the library. Another mark of its popularity resides in the fact that I did have the book out from the library but I could not renew it because there is still a queue for it, more than a year later (despite a plethora of copies in the public system): I hope you don’t have to wait for your copy! This is a fantastic post. You really captured some of the things that make this book incredible — the personal stories and the attention to detail. I just loved this one. Thanks, Kim. It’s a fantastic book. I wish there were more like it! And if this is the kind of writing that garnered Wilkerson the Pulitzer for her feature stories…no wonder! What a fantastic review. It seems that everyone who has read it has enjoyed it as much as you and I. I was so drawn into their stories that they almost felt like friends at the end. I definitely shed some tears, too. Oh, there were definitely a couple of sniffles in this corner, too. (I can still pick out the individual moments.) And at least one instance in which the book was pushed aside in complete and overwhelming disgust. But the contrasting emotions (because there were definitely some triumphant and satisfying moments too) added so much to the experience, and that’s not something one says about history books all that often! You’ve sold me on this one! I don’t read much non-fiction, but this one sounds like it would be right up my alley. I’m in the library queue or it now. Thanks! I hope you enjoy it, Carrie. I’m a bit surprised myself to have made it through — when fiction is my first love, and when I’m more likely to read books half its size — but it was truly a pleasure to return to it every time. And it’s such a big book for you to take on right now, with the wee reader insisting on his own storytimes, but it’ll keep for you! I’ve heard great things about this book, too. And I *should* read more nonfiction. This looks like a great choice. You’d especially appreciate Ida May’s segments, Laura; it’s the kind of non-fiction that just doesn’t feel like a “should” and that’s the best kind, right?! I’m so pleased to see that you enjoyed this book. I hadn’t heard of it until loads of people started to rave about it on my recent post about non fiction books. I love it when non fiction is engaging and powerful. This has gone straight on my ‘must buy soon’ list. You’ve got a lot of great titles on your list, Jackie. But, yes, I do particularly recommend this one, and I look forward to your thoughts!